The emissions intensity of SO2, NOx and CO2 from electricity and heat production in public conventional thermal power plants has decreased in 2007 compared to 1992 by 96 % (SO2), 43 % (NOx) and 11 % (CO2) respectively. 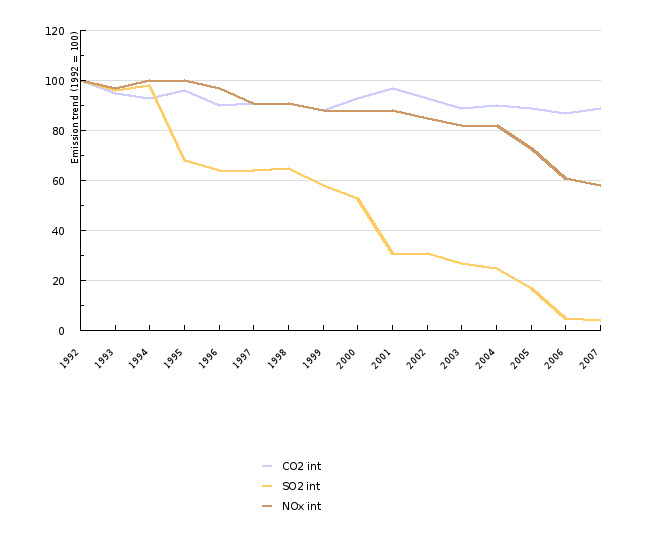 In 2006, SO2 intensity was lower that the EU-15 average, while NOx and CO2 intensity was substantially above the EU-15 average. The indicator shows the emissions intensity of SO2, NOx and CO2 of public conventional thermal power (electricity and heat) production. The indicator is calculated as the ratio of emissions of individual substances to the output of electricity and heat. CO2 is the most important greenhouse gas that causes warmth to be trapped in the Earth’s atmosphere, thus causing the surface temperature to increase. This will have numerous direct (more common and longer lasting heat waves) and indirect (greater frequency of extreme meteorological events, rise in sea level, etc.) effects on the ecosystem and the human population. SO2 contributes to the acidification of the atmosphere and emission of (secondary) dust particles. A chemical reaction converts NOx into ground level ozone, while this gas, the same as SO2, contributes to the acidification of the atmosphere and emission of (secondary) dust particles. Public thermal power plants and cogeneration plants are companies whose main purpose is to produce electricity and heat. In electricity production, production at the generator is considered. Jožef Stefan Institute, 2009, Data: Environmental Agency of the Republic of Slovenia, 2009; Statistical Office of the Republic of Slovenia, 2009; Ministry of Economy, 2009. Jožef Stefan Institute, 2009, Data: Environmental Agency of the Republic of Slovenia, 2009; Statistical Office of the Republic of Slovenia, 2009; ETC-ACC; Eurostat, 2009. - reduction of SO2 emissions to target values of 27 thousand tonnes. The amendment of Directive 2001/81/EC on national emission ceilings for certain atmospheric pollutants will determine new targets for SO2, NOx, NMVOC, NH3 and PM2.5 emissions for 2020. Objectives summarised by: Resolucija o Nacionalnem programu varstva okolja 2005-2012, (Resolution on the National Environmental Action Plan 2005–2012, Official Gazette of the Republic of Slovenia, No. 2/06) and the proposal of the climate and energy package, Protocol to the 1979 Convention on long-range transboundary air pollution to abate acidification, eutrophication and ground-level ozone and Directive 2001/81/EC of 23 October 2001 on national emission ceilings for certain atmospheric pollutants (the NEC directive). Source database or source: Official data on SO2, NOx, CO2 (numerator) and greenhouse gas emissions were used to calculate the indicator (see EN01) as well as data on electricity production in public thermal power plants and cogeneration plants – at the generator (1992–1995 – the Jožef Stefan Institute (the method of calculating the used energy balances is presented in detail in the description of EN10 Final Energy Consumption by Sector indicator), 1996 onwards – the Statistical Office of the Republic of Slovenia) and data on thermal power (electricity and heat) production (1992–1999 – the Jožef Stefan Institute, the year 2000 onwards – the Statistical Office of the Republic of Slovenia) (denominator). Data administrator: The Environmental Agency of the Republic of Slovenia, the Environment Office, Air Quality Sector – Bojan Rode (Air Pollutants) and Tajda Mekinda Majaron (GHG); the Statistical Office of the Republic of Slovenia – Mojca Suvorov, Jože Zalar. Date of acquisition for this indicator: 8 December 2009. Methodology and frequency of data collection: Data are prepared on an annual basis and on the basis of data on activities (the use of fuels, industrial manufacturing, etc. ), calorific value of fuels and emission factors. The recommended methodology has been prepared by the UNECE/EMEP task force on emissions inventories and projections (EMEP/CORINAIR Emission Inventory Guidebook – 2006). Data on electricity and heat production are prepared (collected) on an annual basis and published on the website of the Statistical Office of the Republic of Slovenia and in printed form. Data have also been sent to Eurostat. The EUROSTAT/IEA methodology was used in preparing the data. Two different sources of information were used – before 1996, the source of information was the filled in EUROSTAT questionnaire and since 1996, the official statistics of the Statistical Office of the Republic of Slovenia. The legislation influencing the emissions intensity is as follows: Decree on Emission Limit Values Discharged into the Atmosphere from Large Combustion Plants (Limit Values of SO2, NOx), the Environment Protection Act in relation to the Decree on Activities and Installations Causing Large-Scale Environmental Pollution (Uredba o vrsti dejavnosti in naprav, ki lahko povzročajo onesnaževanje okolja večjega obsega, Official Gazette of the Republic of Slovenia, No. 97/04) by implementing environmental permits (facilitating energy efficient technologies). A fundamental instrument for the intensity of CO2 emissions is the greenhouse gas emission allowance trading scheme implemented by the Environment Protection Act (Zakon o varstvu okolja, Official Gazette of the Republic of Slovenia, no. 41/04). Data processing methodology: The indicator is calculated as the ratio of emissions (SO2, NOx and CO2) to total electricity and heat output of public thermal power plants and cogeneration plants (EUROSTAT code 101121). The used emissions are those of the electricity and heat production sector (CRF 1.A.1.a, NFR 1.A.1.a). Annual growth is occasionally shown in percentage points. The percentage point is a unit used in comparing different percentages. In percentage points, we are dealing with an absolute comparison calculated using the following formula: (nthis year) – (nlast year) = 16 % – 15 % = 1 pp (e.g. if there was a 15 % growth last year and a 16 % growth this year, then this year growth is 1 percentage point higher). The difference in growth can also be expressed by relative comparison using the following formula: [(nthis year / nlast year) * 100] – 100 = [(16 % / 15 %) * 100] – 100 = 6.7 %. In this case, growth is expressed in percent. Geographical coverage: The EU-15 countries are Austria, Belgium, Denmark, Finland, France, Greece, Ireland, Italy, Luxembourg, Germany, the Netherlands, Portugal, Spain, Sweden and the United Kingdom. Advantage: Officially reported data that are calculated using internationally confirmed methods have been used to calculate the indicator. By improving the methodology of calculating NOx emission records using actual emission factors and not default factors and moving fuel consumption by auto-producers to the industry sector, the calculated emissions are closer to the measured emissions included in the REMIS emission register of stationary sources of pollution. - EEA, 2008. 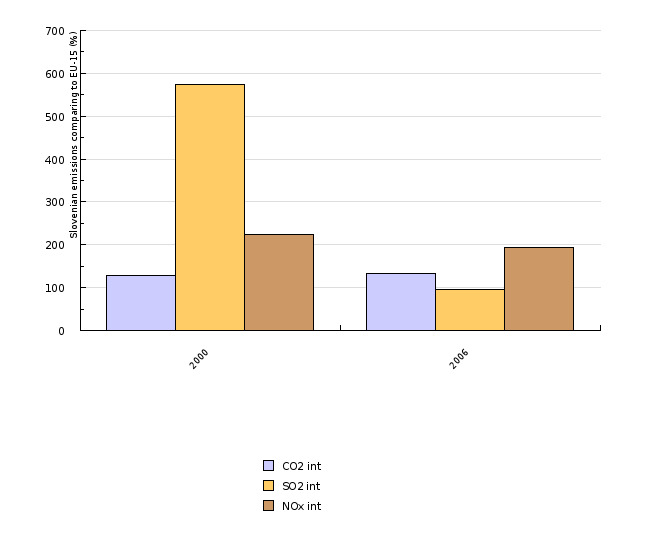 EN08 Emissions intensity of public conventional thermal power (electricity and heat) production. - ELES, 2008. Annual reports. - The Statistical Office of the Republic of Slovenia, 2009. SI-STAT Data Portal. - TEB, 2009. Brestanica thermal power plant website. - Šoštanj thermal power plant, 2008. Annual reports.